Whereas social media has been demonized lately, especially Facebook, there are some brights spots such as Instagram saving the independent book store. I’m indifferent to regular books or ebooks, but I know some people (Grace…) would prefer a real book. Youth is wasted on the young. Another great coffee book for Star Wars fans. I’m going to have to add it to my Christmas list! Throughout the 20th century, the Titanic had reached almost mythical status due to its location being unknown. Little did I know that Dr. Ballard was also a commander in the US Navy and found the Titanic because he was also doing classified work for the Navy. I want to know where I get the job to time how long you have to eat McDonald’s Fries. Autoplaying videos are the worst, but there is hope on the horizon. Firefox 66 is set to block autoplay videos. Reading through the comments makes me weep for humanity, I don’t understand these people that want autoplaying videos. I knew the first song played by computers was A Bicycle Built for Two, but I never knew about the first computer art. 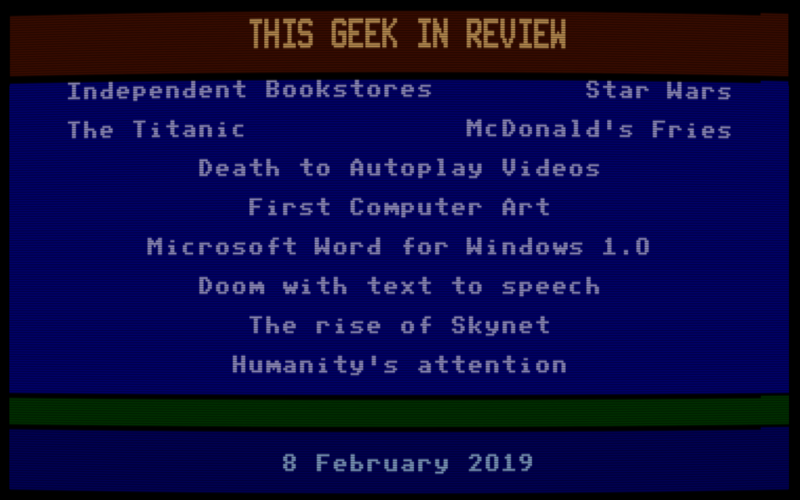 This is interesting reading, the postmortem on Microsoft Word for Windows 1.0. How do you get Skynet bent on destroying humanity? Start by harassing self driving vehicles. A physicist has come up with an equation telling us how long an event can hold humanity’s attention. ← New ATM at Quest!